If you want to know why you hear so much about bad judges, police, lawyers, government and courts then look no further than the number one cause “victims”. Each year millions of people in America are victimized by public servants, lawyers and government. The next problem is who do you call when this happens to you? Better yet will they listen or do they do something? If you personally have been a victim you’ll know most of the time nothing is done and no one cares. This is the main cause of distrust and anger today. A broken system run by the same people who commit the crimes who are in charge of being those we are told to turn to when they commit crimes. Police for example have no business being in charge of investigations where their own are known suspects. Judges are nothing more than lawyers who made it to the bench and having lawyers or judges oversee them is totally nonobjective or sane. They ole saying comes to mind here, “You never put the fox in charge of guarding the hen house”. America has become a country of victims, that is unless you find your way into a public servant position. Often roles with built in immunity are in fact the problem because what happens when those who are hired are really criminals and con-artists? 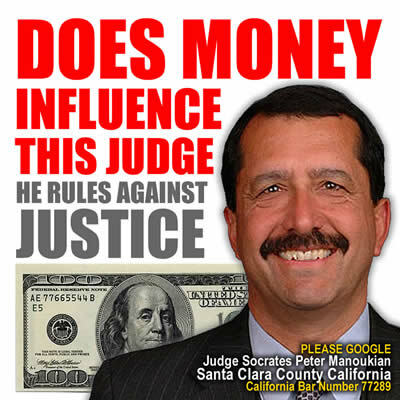 Santa Clara County California Judge Socrates Peter Manoukian is a prime example and poster boy for “Corrupt Judges” which have overwhelming victim number however government and authorities do nothing. In face evidence shows police and sheriff departments are being used to help terrorize and victimize anyone who comes forward with evidence. Via false incarcerations, fraudulent police reports and terrorizing the public with threats and harm. They all revolved around the same Judge Socrates Peter Manoukian who covered up the death of Robert Moss. 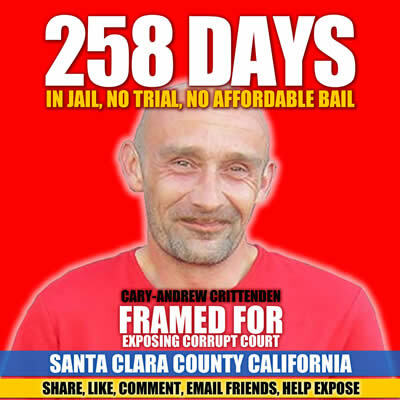 Used law enforcement to terrorize Heidi Yaumen a disabled women and imprison Cary-Andrew Crittenden who helped Heidi by reporting the crimes and corruption of Santa Clara County. The commission’s mandate is to protect the public, enforce rigorous standards of judicial conduct and maintain public confidence in the integrity and independence of the judicial system. While the majority of California’s judges are committed to maintaining the high standards expected of the judiciary, an effective method of disciplining judges who engage in misconduct is essential to the functioning of our judicial system. Commission proceedings provide a fair and appropriate mechanism to preserve the integrity of the judicial process. Anyone may submit a complaint to the commission. See Filing a Complaint and Overview of Commission Proceedings. This is the underlying story of how judges taking illegal county and court payments and county supervisors making such payments to increase their own salaries corrupted the California judicial system. California’s Judges Are the Highest Paid State Judges in the U.S. California Superior Court judges can earn $186,000 per year in state salary plus state benefits before receiving “Supplemental Judicial Benefits” under the formula of Govt. Code 68203. Superior Court [Trial Court] judges in Los Angeles County currently earn as high as $379,604 in total annual wages [$310, 268 –regular pay; $69,336- other pay] and $51,116 in total annual retirement and health cost in a regular pay range classification of $189,041 according to the Office of the State Controller Government Compensation in California 2015. Why Does LA County Pay “Supplemental Judicial Benefits”? On its face, such explanation doesn’t make sense. Paying a sitting judge a “supplemental benefit” will not retain him in office as he/she must face an election to retain his/her judicial office. It will not recruit a judge as the judge is already in office. Nor does it appear that over time the “Supplemental Judicial Benefits” attracted more successful, experienced private lawyers to apply to be politically appointed for judgeships or to run for judgeships more than the usual government lawyers such as deputy district attorneys, deputy public defenders, county counsels and state employees. Article II, Section 4 demonstrates it is in the interest of each member of the LA Board of Supervisors to pay the Superior Judges more money so they can pay themselves more money. LA County Paid Approximately $400 Million to Judges and Simultaneously Raised the Supervisors Salaries. The result was LA County paid the approximate 430 LA County Superior Court judges approximately $400 million in “Supplemental Judicial Benefits” since the mid 1980s. This resulted in pay raises for the LA County Supervisors “claimed under law”, irrespective of the constitutionality or legality of the law. Think judges, Police, Government or any other public servant does not lie and abuse their power? Think again, why does it need to get to epic numbers or victims before anyone listens?